Food Secure Canada, and especially the Coalition for Healthy School Food, have important wins to celebrate in the 2019 federal budget announced March 19th. After years of advocacy, a budget line is established for “Canada Food Policy” with $134 million in funding over five years for four specific areas of action, and a commitment to create a National School Food Program in cooperation with provinces and territories (with no dollar amount attached). While the Food Policy for Canada is yet to be announced, the budget includes support for local food projects and for communities tackling Northern food security, food waste reduction programs, and a pilot project towards permanent residency for immigrant farm workers. These align with important policy demands from the food movement, as well as priorities from some sectors of the agri-food industry. Leadership by the federal government in creating a National School Food Program, together with other levels of government, is a huge breakthrough - the previous argument that the federal government has no jurisdiction around school food has been abandoned. It is a testament to the smart campaigning by school food advocates for decades! 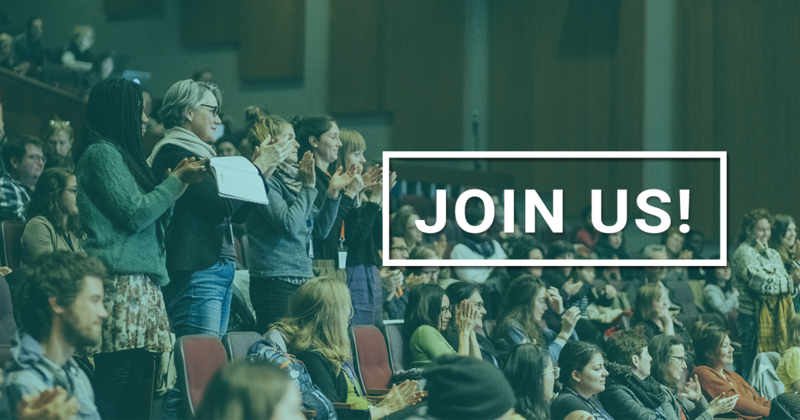 Let’s hope that all the momentum that has been generated will not be squandered on long intergovernmental negotiations with no support for community groups already delivering vital programs in schools across Canada. We need to build on the good will and excitement that the Coalition for Healthy School Food has generated. If these budget lines are just the leading edge of a more ambitious Food Policy that will pull together action across government departments and the food system, then we really have something to celebrate. Without that policy, this budget looks like a piecemeal collection of relatively small funds that sit almost entirely within Agriculture and Agri-Food Canada (AAFC). It is worrying that, despite multi-stakeholder support, and acknowledgement of the importance of governance in the What We Heard report, there is no mention or budget for an inclusive governance mechanism, like a National Food Policy Council. FSC and others will be working hard to ensure that Minister Bibeau makes that happen. What is included and what is missing ? The What We Heard report on national food policy consultations organized priorities in four big buckets: food security, health and food safety, environment and economic growth. These areas of work do not appear explicitly in the budget. We hope and expect that this wider framing, recognising the scale and scope of food policy across departments and silos, will inform the actual Food Policy for Canada. Both the public consultations and the AGRI Parliamentary Standing Committee worked on this basis and generated robust demands for an ambitious food-systems approach. 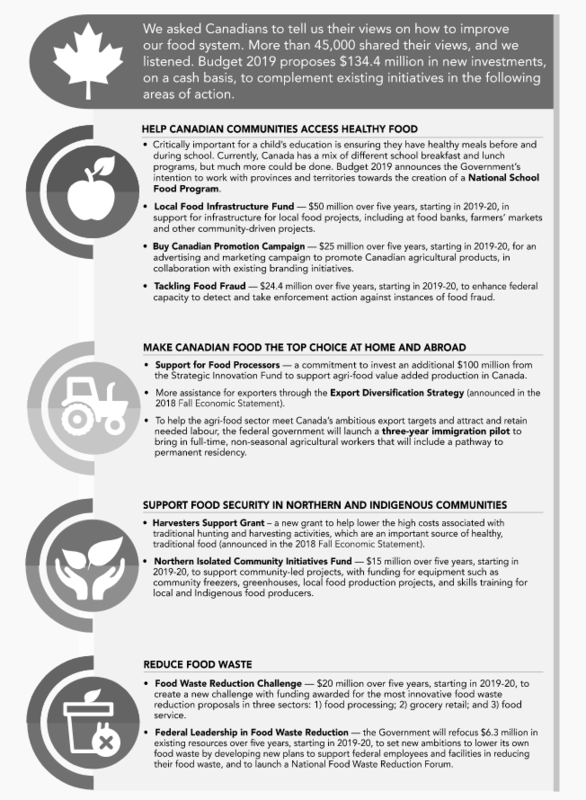 What we have for now is grouped in four areas for near-term action -- Help Canadian Communities Access Healthy Food; Make Canadian Food the Top Choice at Home and Abroad; Support Food Security in Northern and Indigenous Communities; and Reduce Food Waste -- with associated budget lines. See all the detail in this graphic from page 163 of the budget and in this article (paywall) by Kelsey Johnson of ipolitics. Of the total new money, $134.4 million over five years, $65 million is earmarked for community-led and socially innovative funds. We broadly applaud this approach, but regret that there are not more robust measures or linkages with poverty reduction. Specifically over five years, there is $50 million for a Local Food Infrastructure Fund aimed at community groups and $15 million for Community Initiatives for food security in the North. Then, there is $20 million for a Food Waste Reduction Challenge in the food processing, retail and food service sectors. Hopefully this will be a powerful driver for change, for example in institutions like hospitals where plate waste is a well-known issue. And while it is relevant for government to focus on mitigating its own facilities’ food waste, it is unfortunate that dollars weren’t also made available for supporting more local, sustainable procurement by public institutions which create win-wins for local agricultural economies in addition reducing environmental impacts. Export agriculture priorities appear to be reflected in $25 million for Buy Canadian promotion of agriculture and agri-food here and abroad, along with the $24.4 million for tackling food fraud. Additionally, $100 million of the existing Strategic Innovation Fund will be directed to food processors. Where are the budgets held? $95 million dollars of the new investments are held by AAFC, with $24.4 million with the Canadian Food Inspection Agency (food fraud) and the $15 million for the North held by the Canadian Northern Economic Development Agency. This simply underlines that the commitments to date are narrow, and eventually we need a food policy that brings together and harmonises ambitious health, poverty reduction, environmental and reconciliation goals. In this regard, the sums we are discussing here are miniscule compared to the overall budget of AAFC ($1.9 billion according to the 2019 Budget Expense Forecast) and indeed the export target for agriculture and agri-food, with the Economic Strategy Table calling to increase it from $75 to $85 billion dollars by 2025. Two of the most significant commitments are actually unfunded -- the national school food program and the immigration pilot project for full-time, non-seasonal agricultural workers with a pathway to permanent residency. This latter initiative is explicitly linked to meeting export targets. Supply management compensation includes $2 billion in income supports and $1.5 billion for loss of quota value, amounts that were judged insufficient by some key agricultural organizations. There is also a brief reference to the Healthy Eating Strategy that includes marketing to kids but no explicit mention of Front of Package labeling. These are just two of the other issues in the budget that are important to our movement. We certainly welcome the new investment in Indigenous infrastructure, and more support for seniors. See below for important commentary from our members and supporters about the food policy and other issues that grabbed their attention in the budget. In the coming days and weeks we will keep this blog and these links updated, as we analyse and reflect on what this all means.